Our heat pump system will soon commence its third heating season. The amount of measurement data collected so far has exceeded the capabilities of the software I had once developed; so I crafted a new application based on a real database server. Now you know why I was not very active on social media recently. I have an excuse to talk about our system again: A reader asked for an English version of one of our German articles. The solar/air collector had to be re-built! After all, our own system is also the live demo we show off to potential clients! Unglazed solar/air collector from plastic ribbed tubes, supporting construction from larch wood. Designed and built by the Chief Engineer, physics PhD and carpenter-artist at heart. One of the guiding principles in designing this system was to use off-the-shelf components only so that it could be built by a DIY enthusiast. Fortunately this type of cheap collector has also superior properties with respect to convective heat transfer. The heat pump involved is actually the simplest, the ‘most stupid’ device you can buy. We don’t like the trend of equipping any heating system with a so-called energy management system that tries to control nearly any device in the ‘smart home’ – doing all that running on some proprietary black-box software. Controller UVR1611 by Austrian company Technische Alternative GmbH. A controller is needed to control the valves for diverting the flows of brine and heating water, to switch on and off the heat pump and all other supporting pumps, and to log those tons of big data generated by sensors for temperature, flow, and radiation. 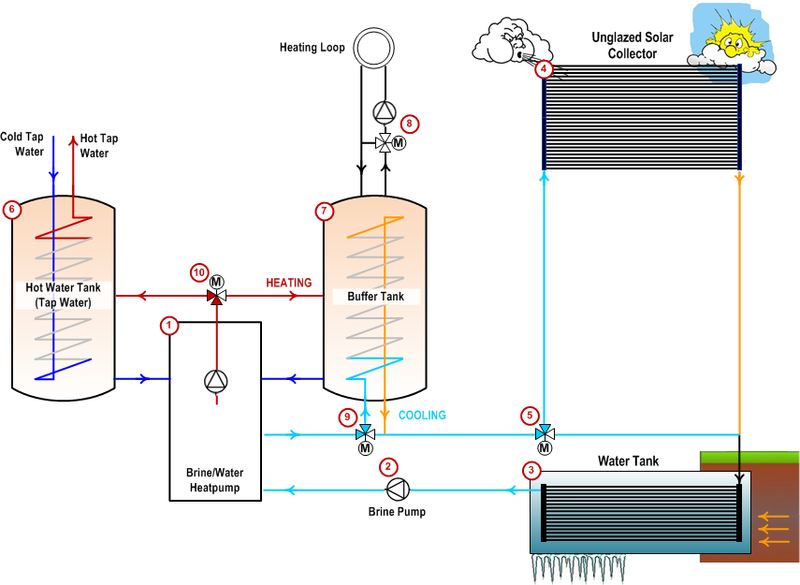 A single brine circuit connects the heat pump, the solar/air collector, and the underground water tank. Depending on ambient temperature, water tank temperature and heating demand, the collector may be bypassed. 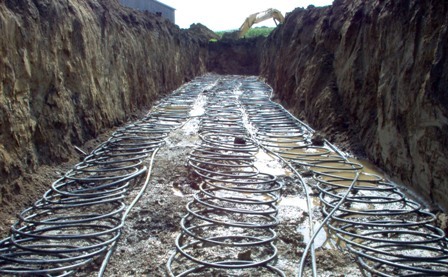 The brine-water heat pump is the same that would be used with ground loops. Every heat pump needs a big reservoir of heat energy, and electrical energy is needed to extract (‘pump’) that heat. Typical heat sources are the ambient air, ground, or ground water. Different types of heat pumps are used in different countries – I guess for historical reasons and thanks to lobbying of vendors. It seems to me that geothermal heat pumps are more common in Europe while elsewhere air heat pumps are more popular. ‘Geothermal’ is a misnomer as this is not real geothermal energy from the core of the earth that’s harvested here – it is energy from solar radiation stored within with first 100 m of ground within the warm season. This is true both for ground loops placed in about 1,5 m below the surface, as well as for deep bore holes. 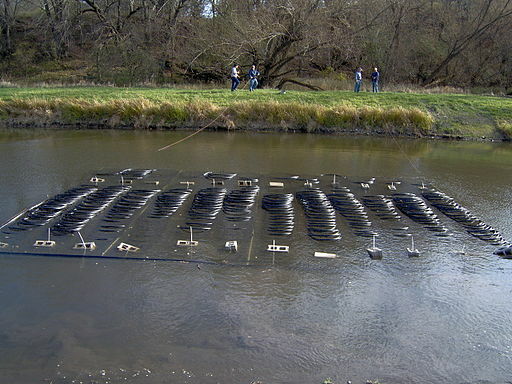 A pond used as a heat sink for a heat pump (Wikimedia user Mark Johnson, public domain). We had been searching for an option to heat our old house, and that can be built rather easily – that is: without creating a huge pile of soil we had no place for ‘parking’ it while installing ground loops. In the region where we live, traditional homes and premises are rather small – the plot layout resembling stripe-like elongated rectangles. Think 5×15 m2 house on 10×60 m2 land. To the left: The other part of the mansard roof of the L-shaped attic (The rooftop shape is not typical – it was rebuilt from scratch a few years ago). One long side of each building coincides with the plot boundary. These old houses had been very small farm houses decades ago – we found some remainders of the equipment for processing grapes in the shed. In contrast to other regions, splitting of farm land among heirs had not been forbidden for a long time – so individual property became smaller and smaller. These pieces of land are called ‘belt fields’ because of their shapes. Here is a video documentation with English subtitles – about the traditional Pannonian ‘Streckhof’ (‘stretched house’). The earth cellar beneath the shed. The water tank, lid open. The black tube is a manifold connected to the heat exchanger tubes. The cellar has been made water-tight with pond liner. The heat exchanger is immersed in the water – the ‘loops’ have been built from the same type of ribbed plastic pipes as the solar collector in the garden. The performance of a heat pump is the better the higher the temperature of the heat source is. But even when the water starts to freeze the temperature remains at 0°C degrees and thus the performance of the heat pump is kept at reasonable levels. The energy gain from freezing is high: One cubic meter of water translates to 93 kWh. A heat pump system does of course not make you less dependent on electrical energy – but it makes us here in middle Europe less dependent on Russian gas while providing the same convenience to the user. We have fairly good power infrastructure and upgrades to the (smart) grid are required as we need to integrate decentralized sources renewable energy like solar power and wind power. I can see the blades of those wind turbines from our office (Enercon E-101, 3MW rated power each). Heat pumps can help to make grid operations easier as they usually heat a hot water buffer tank (or the concrete ‘buffer’ of the house). So utilities may cut off electrical power for some hours at an arbitrary point of time as heat pump systems need to have energy storage for ‘offline times’ built in. This entry was posted in Heat Pump, punktwissen, Science and Technology and tagged DIY, Energy, Engineering, Heat Pump, Heating, Renewable Energy, Technology by elkement. Bookmark the permalink. I didn’t have time to comment when I first read this post. I know I was the one who kept mixing up the energy source this system is replacing. I’ll mention that we had been looking at heat pump and solar collector options, and the geothermal systems, because we did not have access to a gas service. Our heating was managed through an electrical furnace, and was very expensive. The house we had at the time was also very poorly built… on the video the builder said that most “eyesores” of Austrian building were committed in the 60’s… well that is also true in Canada, but the real building nightmares arose in the 80s with shoddy construction and significant cost-cutting measures that resulted in structure lasting about 15 to 20 years before decomposition had begun to undermine structure. So… you can imagine a cool, damp, poorly insulated house combined with very high energy costs. From my anecdotal evidence it was the 1960s and 1970s then architecture had improved a lot – both with respect to design and energy efficiency! When we were much later looking for houses on sale I totally liked them. Probably it is because I started enjoying the idea to have a house you can “experiment” with instead of feeling that pressure to design and build a modern house that theoretically should fulfill all your requirements. An electrical furnace is proabably the perfect heating system to be replaced by a heat pump as you will replace a part of the electrical energy by “ambient energy”. But unfortunately if a house is poorly insulated you need high temperatures in your heating system, and then the performance factor of the heat pump is low… which would mean there would not be a positive return on investment within many years. Yes, we were planning to build another house, but then had to move. The plan was for very thick walls, smaller windows that could access the breezes for natural ventilation. We would do two floors, as well, and mostly the entire floor plan was to be the rooms all in a row. We had a small area to one side for utilities. I was conscious of it being a little like European designs, especially those with straw in the walls for insulation. It was a combination of using old methods of conservation with new methods of energy production. You are definitely a European at heart 🙂 I live fairly close to large Lake Neusiedl – http://en.wikipedia.org/wiki/Lake_Neusiedl – and there are lots of reeds. There are initiatives to re-use this as building material and even as raw material to produce pellets – similar to wood pellets used as (a very popular) heating system here. People and companies resurrecting such ancient building material as straw or hemp got some attention and awards in the past years. It is interesting, the fluctuation of the lake. Since European settlement began in my area in the late 1870’s, and there wasn’t an archive of written data kept by the First Nations people, we don’t have long-term records of moisture fluctuations. Thus, when bodies of water dry up farmers take over the area and are highly alarmed when it fills up with water again. I love that I now have a specific example for reference in these years of high water levels. There is a little of the same resurrecting of old building methods here. A few old (heritage) buildings show such structures as early examples of European adaption. The straw and plaster buildings seem to me the most interesting and effective for our hot (+40C) to cold (-40C) temperature fluctuations. I suppose it was due to the mass marketing and catalog sales of “stick” built houses (timber frames) that could be sent as building packages on trains that led to their popularity in Saskatchewan. A lack of stone masons limited the extent of stone construction. These houses were also efficient for maintaining internal temperatures… and goodness knows, we have a readily available supply of rocks! The system can switch to ‘cooling mode’ by having the brine flow through the tank denoted as (7) in the schematic: This hot buffer tank (7) is in winter used to transfer heat to the heating loops. When cooling is required the brine (light blue circuit) is diverted to flow through this tank by resetting valve (9). Thus the water in this tank is cooled by the water in the underground tank. Then the cooled water in tank (7) flows through the floor heating loops that effectively serve as ‘cooling loops’. What we like in particular about this solution is that you still can heat hot water during the cooling season as we use a second (hygienic storage) tank for hot tap water (6). If we heat hot water the underground water tank is even cooled more. Yes, it is a niche market – it is too early to say that this is a big success but there are really home owners who google for systems like this and find our blog and website (which I had never expected as we don’t do search engine optimization and our blog is not very ‘business-y’). The concept as such – using a big volume of water as a heat sink is somewhat popular in a small and more nerdy community of DIY tinkerers – and it is these ‘innovative’ clients who seem to find us. Fascinating in so many ways! It’s nice to see the schematic, as I was really struggling to grasp how you were doing this. Now I more-or-less get it. The tank! I had a vision of something like the kind of tank used by gas stations for underground storage; an expensive proposition. Your solution is ingenious! Your comment on dependence on electricity got me wondering about the typical COP on your unit that you are seeing over the year. Have do done any recent calculations on it? It’s especially interesting to me as, up until recently, our electricity was quite cheap–the equivalent of around €0.08/kWh–but it is expected to increase somewhat (I am guessing around 50-60% more although the government assures us all it is more like 30-40%) as we are currently constructing significant extra hydro power as well as some LONG transmission lies for it. Right now straight up electric heat is affordable even in the long run but with the increases I think people around here, thinking long-term, will all have to move to one form of heat pump system or another. Presently the air heat-sink/source ones are almost 100% of the installed base but I think your design makes a LOT of sense. Another option for building the tank is using a (former) cesspit or the like – something we have just discussed with another client. I have also seen other projects using ponds. So the (measured, honest) long-term seasonal performance factor of performance is well above 4 – even including heating of hot water (…and we are not perfectly eco-friendly water-savers I have to admit..). This is much higher than that for air heat pumps but those are marketed quite aggressively here – of course it is rather easy to install them as you only need one contractor and don’t have to dig a pit… but you pay for that in the long run….